A couple of weekends ago I went to Montreal to see one of the special guru type people I have in my life. Though actually she is not a guru the way Robert Moss or Ohki Simine Forest are in the sense of giving workshops and teachings and publishing books, still she has been a major influence. Really, technically, she is simply a psychic. But she is a special psychic – not a corner store neon sign flashing crystal ball type psychic, but a real bona fide seer – special enough to take the bus to Montreal just to have a session with her. The first time I saw her – sent there on the recommendation of a friend who had heard of her but said she didn’t have the courage to see her herself – she completely spooked me out. The spook was in part because her eyes remain half closed, flickering, the whites of the eyes showing through her eyelashes while she talks. Partly she spooked me simply cause she saw everything in my life with such a searing clarity it was like a knife slicing open my clothes and cutting into my chest and ripping my heart out into the light of day. However. She never remembers what she says or even your face if you were to meet her in the street – a fact that I’ve become grateful for, as it makes the session entirely private. She explains the first time you see her that what she does is not about predicting the future, but is about serving as a kind of mirror, reflecting back to you the deeper voices inside your life that need to be heard. Part of what I love about her is that she’s a Buddhist – well, she doesn’t declare herself as such, but it’s obvious from the few books on a shelf, from the minimalist decor, from the mockery she will make of things like attachment to desire and hope – evidence of Buddhist teachings and philosophy. This trip I took I’d been craving to see her for months – I knew she would be able to speak to something I was struggling with in my own creative projects, a lack of focus, too many ideas. I’d been struggling with myself and knew I was flapping in the wind, not on track, not clear in my direction. I got on the bus essentially hoping she would tell me which project I should do. She didn’t – instead she chastised me (as she always has – or perhaps as my own internal voices always have) and the entire experience left me in a terrible funk for several days. But pulling out of the funk, I focused on her instruction, her teaching, which was: GO DEEPER. Take up serious practice. Get a life coach, meditate, do yoga, something, anything that will make you Go Deeper. So as a first step I’ve loaded up the iPod with some meditations and teachings by greats like Pema Chodron and Lewis Mehl-Madrona (a very interesting physician / story teller / healer of the indigenous persuasion) and a new-to-me, but very known and experienced teacher, Thich Nhat Hanh. 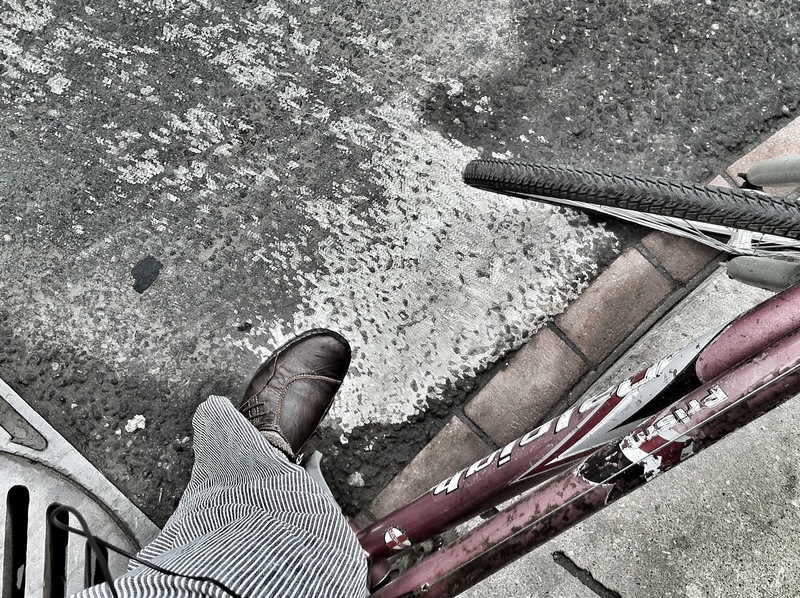 Well, Thich Nhat Hanh talks a lot about mindful breathing and mindful walking – and I’ve been listening to all this on my bike ride to and from work. And at first, I thought, well I don’t really have time for mindful walking, I need to get to work, so maybe mindful walking is like mindful biking in a way…. 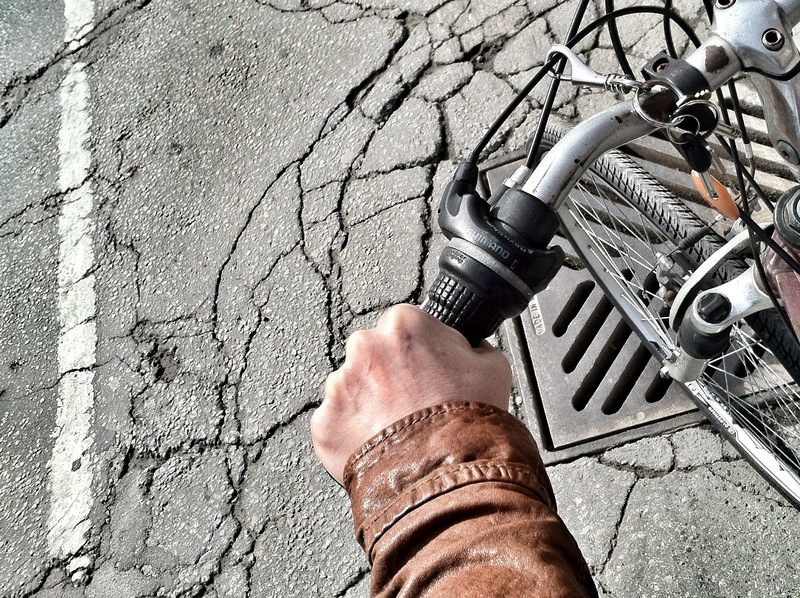 but the distractions of traffic, and trucks unloading in the bike lane, and the dicey characters on the way down Sherbourne who eye the purse in my back basket, and the terrible bumps in the state of the roads in Toronto these days…. and although I loved the amazing peacefulness of his voice, I thought perhaps it was just all too spiritual for weaving in and out of the cars and streetcar tracks, trying not to get side-swiped by the cube trucks talking on their cel phones…. But then I got to a bit in the recording about mindful driving. Well then, true love. I love this man’s knowledge and appreciation of the human condition so completely…. And slowly I’m starting to shift my anger at the trucks in the bike lane ever so slightly. The bumps in the road seem more like an opportunity for an ab exercise to suspend myself above the bike and not feel the bounces of the path. 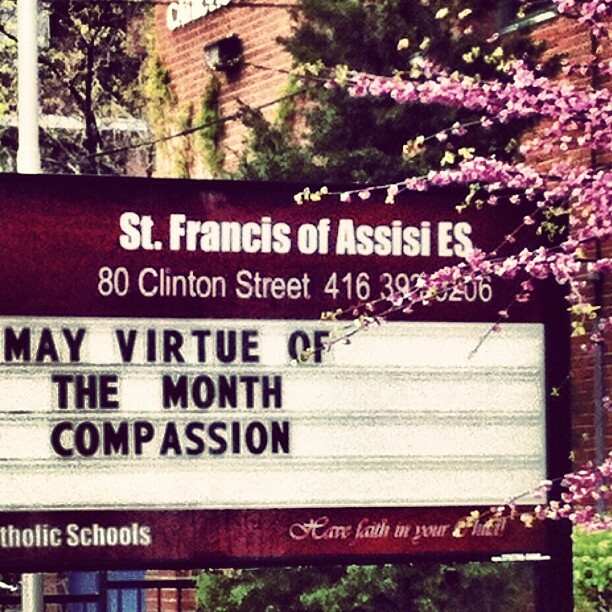 And I’m starting to look at the dicey characters on Sherbourne Street with some affection and compassion. Brilliant… I love my 30min drive to work, and mindfulness makes it ever easier..
Love, LOVE this. Great pics too. a lovely read. as lovely as when you told me. photos take me in even more. Go Deeper. caps. definitely deserves caps.